No 12 | D12 : Welcome to the VintageSaws.com Online Store! The #12 and later D12 was the finest regular production saw that Disston made. 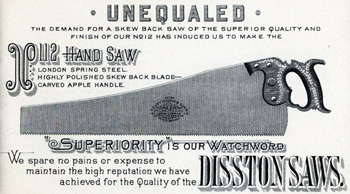 Marketed to cabinetmaker professionals who demanded nothing but the very best, the #12 line of saws had many loyal customers. Offered beginning in 1865, the saw was made continuously until 1954 when it was discontinued just prior to the sale of the company in 1955. For the period from 1865-1927, the saw is characterized by a straight back with nib with the older style handle which stood proud of the blade. The handle was finely finished and polished, complete with intricate wheat carvings. Full size versions of the saw had 4 nuts, with smaller panel sizes having only 3. The blade had the highest "London Spring" refined steel and had a harder temper which was ground a gauge thinner than other saws of the period. The result was a saw that needed little set, ran true in the cut and was a joy to use. Saws from this time frame are highly sought after, and command the highest prices of any regular production Disston Hand Saw. When the line was redesigned in the late 1920s, the result was a saw similar in characteristics, but the nib vanished. The blade was narrower overall than in the earlier model, and was offered in both regular and lightweight widths. 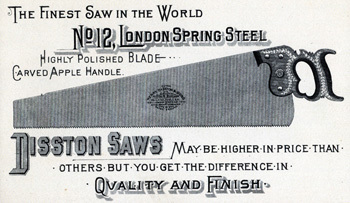 Saws made after 1928 were known as the D12, rather than the #12. The saw made several interesting changes throughout the final years of production. The saw typically was made with an apple handle, but from 1948-1954 it was made of walnut. 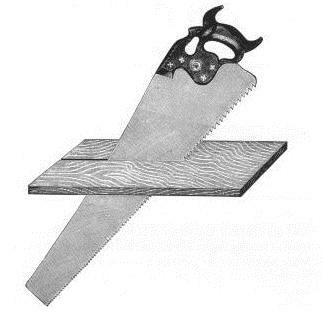 A variant of the #12 hand saw exists, the #112. The #112 is essentially identical to the #12 with the exception that it has a skewed blade. The earliest catalog which I have seen it advertised in the 1901 full line catalog. The exact date is was phased out is not clear, but it almost certainly vanished in the 1920s when Disston revamped their entire line. The #112 is very rare...not many examples of it turn up owing primarily to the fact it was made only about 20 years and was in direct competition with the D8 and D100. It was, however, equally as good as the #12 due mostly to the thin ground blade. Either of these saws are a joy to use and have to be used to understand what makes them so good.